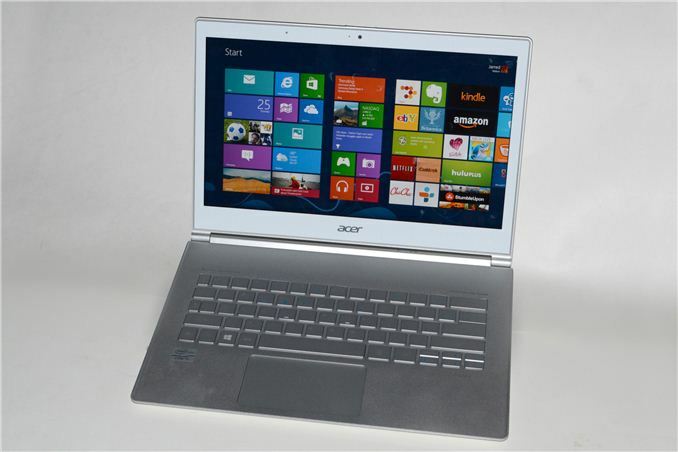 Acer sent along word today that their S7 Ultrabook, now updated with Haswell internals, is available for order. At present, Acer lists two different models; as usual, the less expensive model includes a Core i5 processor and a 128GB SSD, and the high-end model upgrades the CPU to a Core i7 processor and includes a 256GB SSD. Thankfully, both come with 8GB memory and a 1920x1080 IPS touchscreen display. Anand previewed performance of the Acer S7 around the time of the Haswell launch, but it was prerelease hardware. We don’t expect performance to have changed much, but battery life should be better judging by what we’ve seen of other Haswell offerings. Here’s the full rundown of the specifications for the two models. In terms of the exterior design, as far as I can tell nothing has changed – for better or for worse – so most of what we said in our earlier Ivy Bridge S7 review still applies. That means you still get a funky keyboard that’s missing the top row of function keys, and there’s not a whole lot of key travel either. Still, it’s an extremely thin and attractive design overall, and just because the exterior didn’t change doesn’t mean that nothing else has improved. Besides the new Haswell processors, the new S7-392 series Ultrabooks come with 8GB of memory now, shoring up one of the weak spots. The wireless solution has also been updated to Intel’s Advanced-N 7260; it would have been great to get 802.11ac, so really the change from a Qualcomm/Atheros 2x2:2 dual-band solution to the new Intel equivalent isn’t likely to radically alter WiFi performance. Finally, the battery received an upgrade capacity as well, making the new S7 even more portable than before. In Anand’s testing, the new S7 delivered just over seven hours of useful battery life (compared to only four hours on the earlier model). Pricing remains roughly the same as before, unfortunately, so even though the new model is definitely better than previous model, we’re not sure how many people are willing to fork over $1400-$1700 for a new Ultrabook. If you count yourself among those who are interested in such a laptop, the new S7-392 models are available starting today at a variety of online vendors. We were able to find at least a couple places that are selling the upgraded model for less than the MSRP, and we think the added SSD capacity and performance is probably worth the extra $200. Get that price closer to $1500 and I’m sure more people would be willing to take a bite. Wally - why not? what's wrong with HD4400?